Note: only player carried items are listed, and card game items, seasonal stuff such as hallowed wands and quest items that only work in a limited area or disappear at quest completition are excluded – seasonal and TCG stuffs will likely merit their own compilation! Note: there’s a screenshot gallery of most of these items at the end of the article! Transforms you into a guitar or lute god. 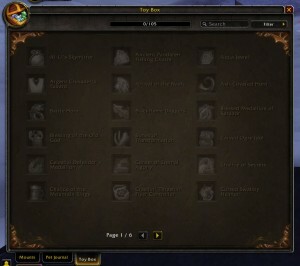 Only obtainable on the BMAH – no reason not to list the most awesome item in-game here though.. Gives you one of many buffs/debuffs when eaten raw, and is the sole reagent for Savory deviate delight, which transforms you into a pirate or ninja. Together with earthroot you can also make some Elixir of giant growth, which increases your strength and size by 11. Can be fished in Southern and Northen Barrens, as well as obtained from a bag of fishing treasures from the Dalaran fishing daily. The sole reagent for Savory deviate delight! Transforms you into a leper gnome for 12s. Made by engineers, the schematic for this item drops from Mekgineer Thermaplugg in Gnomeregan. These trinkets, with the exception of the poultryizer, are meant for teleporting to area in question. Sometimes, however, they have some… side-effects. I recommend bringing a Very Soft Pillow or something similar, should you for example be, I don’t know, teleported into the air. They might turn you into a murloc or trogg, as well. The Gnomish Poultryizer turns your target, or sometimes you into a chicken (this even worked in arenas for some time!). All of these trinkets can be made by engineers – ultrasafe transporters and the poultryizer by gnomish engineers, dimensional rippers by goblin engineers. Not all of them are in Vanilla profession range, but as they are similar, one might as well mention all of them. Turns you into a gnome or troll. Turns you into a frenzy (piranha) and increases your swim speed. Can be obtained by winning the Stranglethorn Fishing Extravaganza (every Sunday 2-4pm game time) – not as easy as it sounds, to win that competition, with the X-realms these days. Turns you into the ghost of Kalytha (NE in purple robes). Can be bought for 4500g from Tex Vortacoil in Azshara (both factions). Turns you into a frog and whispers you one of seven rather questionable things when you kiss him. Mojo is a beast type companion you have a chance of obtaining in Zul Aman – in the new heroic version, when using an Amani Hex Stick to un-hex the frogs in the beginning of the instance you will have a chance of about 15% to acquire the pet. Transforms you into a skeleton, shrinks you or gives you slow fall – or all three if you drink them until you have all three buffs. Can be bought from Sprinkle Noggenfogger; soulbound, stacks up to 20, and you can have as many as you want! Transforms you to look like a member of the opposing faction for 5min. Can be obtained from mobs in Blackrock Spire, Blackwing Lair, Ahn’Qiraj, Ragnaros in Molten Core or Skarr the Broken in Feralas. Turns you into stone, absorbing some damage, but preventing most actions. Created by alchemists (300) from stonescale oil and some crystal vials, the recipe for this potion appears to be a world drop, but seems to drop rather often from Nefarian in Blackwing Lair. Makes your character spew rainbows (doesn’t transform you but.. too awesome to leave out, sorry). The trinket is a reward from the quest Open Their Eyes in Felwood. Transforms you into a furbolg for 3min. Can be bought from the timbermaw quartermaster Meilosh in Timbermawhold, Felwood – however, the item will only appear in the vendor list when you are exalted with the timbermaw. This item is pretty much a replacement for the removed Dartol’s Rod. Increases your attack power and size. Can be looted from Winterfall tribe furbolgs in Winterspring. Enlarges the world for 5min or until you attack. Made by gnomish engineers, the schematic for this item is dropped by Weapon Technicians in the Blackrock Depths.